The name Bédarrides changes over the centuries and related to Bisturritae, in Latin. It refers to the two towers built on the territory after the Roman victory over the Savoyards at the Battle of Vindalium in 120 BC. Property of the Emperor Louis the Blind, he donated it to Bishop Remi in 912. Consequently, the archbishops of Avignon were spiritual and temporal lords of the city and its soil until 1791, when the Comtat Venaissin County was annexed to France. *The parish church of St Lawrence XVII century became a historical monument in 1997. See "The Virgin presenting the Rosary to St. Dominic" masterpiece of Nicolas Mignard. 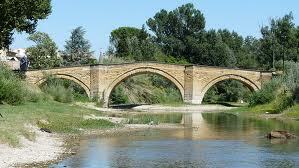 *The Bridge l'Ouvèze, a Roman bridge completed in 1647. *The Fountain - Water Tower (1864). *Three Doors of the old ramparts: the Gate of September 4, the Gate of Freedom and the Gate of Vaison in Vaucluse. *Oratories and several fountains including the Minimes which dates from 1750.